Despicable Me – which is now intertwined with its spinoff franchise, Minions – has been a growing cinematic phenomenon, with its most recent release grossing $1.1 billion at the global box office (that’s as much as Captain America: Civil War!). It turns out, however, that it’s in the realm of theme parks that the property is really seeing some traction. After being introduced as a standalone ride at Universal Studios Florida in 2012 – that would be Despicable Me: Minion Mayhem, but of course – Universal Studios Hollywood received a clone of the attraction two years later, along with a dedicated mini-land, Super Silly Fun Land, which includes a children’s play area, 80 different “water-play features,” and Silly Swirly Fun Ride, a spinner not unlike Kang and Kodos’s Twirl ‘n Hurl. Not to be left out of the action, Universal Studios Japan in 2015 received some Minion lovin’ of its own: a meet-‘n-greet called Minions Super Greeting in Hollywood; a street show in San Francisco that features the lovable goofballs singing the “Banana Song” and deploying “many funny props”; the Minion Mart, which carries exclusive merchandise and culinary treats (some of which are genuinely really cool); and, finally, the Super Silly Space Killer, the carnival game from California. 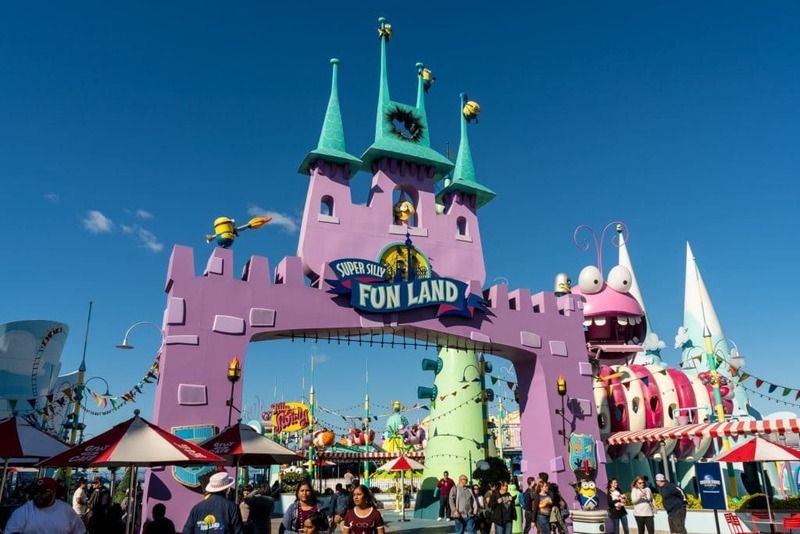 All of these attractions (beyond the Super Greeting) are part of what USJ dubbed Minion Plaza, a stripped-down version of Hollywood’s Super Silly Fun Land. Japan’s smorgasbord of Despicable Me-themed experiences was a play right out of Walt Disney World Resort’s initial Frozen initiative, which was meant to overlay pre-existing park infrastructure with temporary Arendelle events to tide guests over until a permanent ride could be built in Epcot. In Universal’s case, that end-goal ride is none other than yet another clone of Despicable Me: Minion Mayhem, which is set to open on Friday, April 21, 2017 – but, in an interesting turn, the IP’s footprint will be expanded once again to create what is the biggest Minions area in the entire world. The company has just released some brand-new concept art of Minion Park, and we’re anxious to break it down, to see what secrets we can glean from it. Why bother, you ask? Well, this is part of Comcast’s now-worldwide drive to upgrade all three of the theme park locations it owns (sorry, Universal Studios Singapore – we guess you’re just not substantial enough to scoop up… yet), meaning that what the company does in one spot can generally inform us of what’s going to happen in the others. Furthermore, given all the rumors of a third theme park coming to Universal Orlando Resort sometime next decade, maybe we’ll end up seeing an imported version of Minion Park, even bigger and better (not unlike Super Nintendo World, actually). The titular part of the themed land, Minion Park looks like it has a lot in common with The Wizarding World of Harry Potter – Diagon Alley’s London waterfront section – a beautiful garden area that could stand as its own walk-through attraction (minus the heat and the crowds, but of course). It also should serve as a superior alternative to Universal Studios Japan’s current San Francisco, which, while pretty in its own right, just serves as more cityscape in a park that doesn’t feature anywhere near as much real estate as Universal Studios Florida. Even more interesting, however, is how elements from Universal Studios Hollywood’s Super Silly Fun Land have been carried over, starting with at least a few of those water-play features. 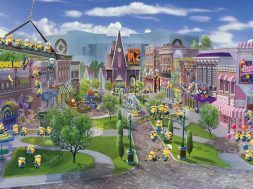 While it’s certainly possible that the water area depicted in the concept art could simply be a fountain – the Minions splashing around could be nothing more than artistic license – it would only follow that attractions that have already been designed, tested, and guest-approved would be included in the biggest-yet Despicable Me land. And this stands doubly true for the carnival games on the left-hand side of the park on the way to Minion Mayhem. A Minion is depicted shooting some sort of projectile into a spinning tray, which immediately conjures the image of many a carnie game, whether in or outside theme parks. The Japanese have the best snack foods on the planet. 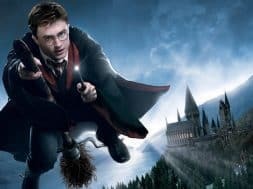 What would a new theme park land be without a restaurant, which, in the post-Harry Potter days, has to serve up exclusive gastronomical delights? Delicious Me, all the way to the left-hand side of Minion Park, looks to be a traditional counter-service eatery (hence the “order here” window) that doesn’t seem to feature any inside seating – which could explain the park benches and tables in the garden section, since it’s a cultural taboo to eat or drink while walking in Japan. 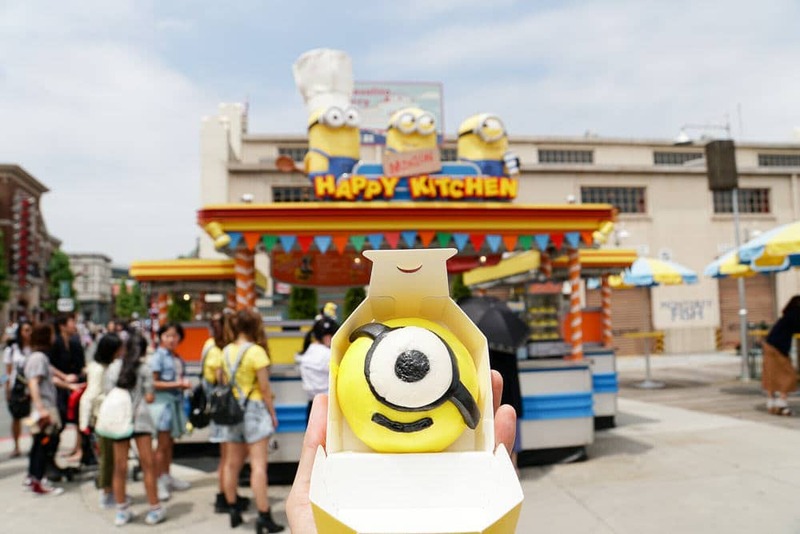 Hopefully, all the various items that were served up at the Minion Mart will continue on here, including a Minion-shaped popcorn bucket with moveable eyeball and arms and – my personal favorite – a Chinese steamed bun in the shape of a grinning Minion face. All the way on the other side is Sweet Surrender: Candies and Treats, which appears to be a fairly straightforward version of either Honeydukes or Sugarplum’s Sweets Shop at the Wizarding Worlds (just with Despicable Me-themed wares, of course). And, finally, there are at least two food carts: one, taking the form of a banana stand, sits at the very back, while a more traditional kiosk is placed off to the right of the candy store. These carts stand as another prerequisite for a theme park land, but also another opportunity for more exclusive dishes to be sold (here’s to hoping that that banana exploding into popcorn can be somehow realized as an actual treat). Here’s where things could get very interesting. There is absolutely no indication that all of the various Minions dotting the landscape will actually translate from the concept art to the nuts-and-bolts real world; while there are plenty of examples of team members wearing Minion costumes at all three theme-park locations already, and while a previous press release makes mention of Minions who “journey alongside guests” through the land’s “winding center passage,” the sheer number presented in the art would pose logistical problems, as would all the various activities the little buggers are engaged in (hanging from the sides of buildings or sitting atop swinging girders, for instance). But there’s reason to hope that at least a few will be present as terrific photo-ops, such as the statue of Chief Wiggum next to the spraying fire hydrant or Barney inside Moe’s Tavern at Orlando’s Springfield, USA. It’s hard to imagine a more fun – or appropriate – feature to offer in Minion Park, just as its Simpsons counterparts at Universal Studios Florida never cease to be crowd-pleasers. Unfortunately, it’s a little difficult to spot what the signage says on the stores in the background, leading directly to Gru’s house and Despicable Me: Minion Mayhem within, and there’s no guarantee that they won’t just be facades, but they constitute nearly half of the land and represent at least half a dozen opportunities for additional shopping or culinary experiences to be had – it’d be a shame to have all this property go to waste. That previously-referenced press release makes mention of a toy store and “hotel” as being major parts of Minion Park, so having these as retail opportunities is a given; anything else would be yet more variations on the Potter theme, where specific shops dedicated to only specific sets of merchandise (candies, wands, robes, plush animals, etc.) occupy nearly every nook and cranny. But even if some or all of these slots are facades, that doesn’t necessarily mean they have to be dead space. One of the most fun touches in Hollywood’s version of Springfield is the additional background elements in place, such as the Springfield Nuclear Power Plant, which features a button visitors can press that activates the plant’s meltdown sequence. Given Gru’s deadly assortment of weapons, gadgets, and vehicles, the sky’s the limit here for similar interactive displays. What Despicable Me-themed experiences would you like to see arrive at Universal Orlando? Let us know in the comments below. next What are the best shoes to wear (and not to wear) at a theme park?